Global VaTax protects and respects your privacy. We will only use your personal information to provide you with useful updates specified for you. Expenses include hotels, restaurants, car rental, fuel, conferences, import and export fees, legal fees and other international expenses. VAT refund on international Travel & Expenses. Hotels, Entertainment and VAT Registration. Corporate expenditure in Europe, UK, Australia, New Zealand, South Korea, Japan, Taiwan, and Canada. VAT is often charged on Research and Development services from international vendors like hospitals, clinics and research centres. Meetings, Conferences and Events, charged by suppliers in foreign countries. Haulage companies and fuel costs can have up to 30% charged on international invoices. Purchasing of goods from a European vendor and then shipping them to European customers. VAT refund on an invoice from a freight forwarder, such as Federal Express or UPS. VAT charged on Professional Fees and Marketing services from European vendors. VAT is charged on Inter-Company invoices to US Companies from its European subsidiaries. VAT refund for international Tour operators and Entertainment professionals. 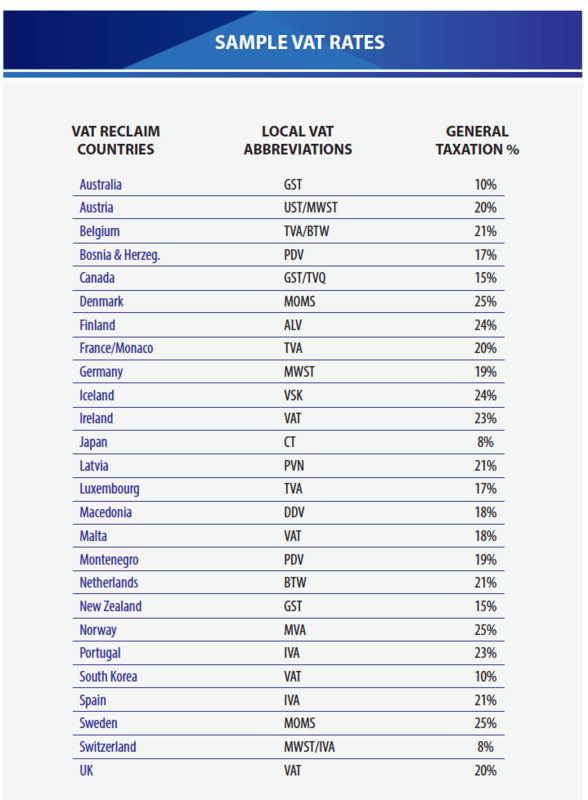 TV and Motion Picture Production VAT charges in Europe.